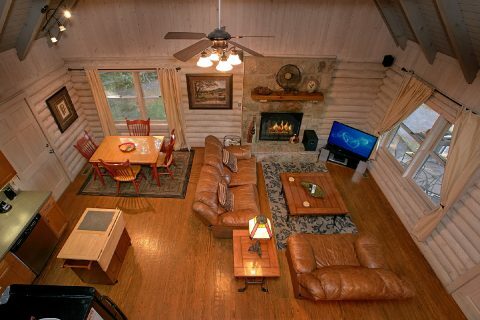 Looking for a private, secluded cabin that's also close to fun things to do in Gatlinburg and big attractions like Dollywood in Pigeon Forge? 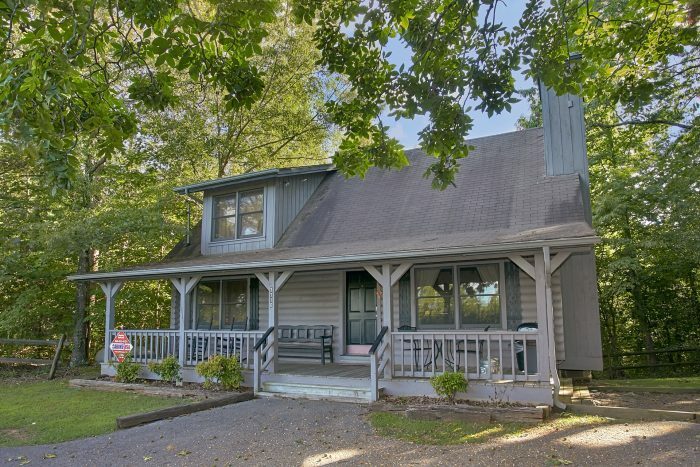 Look no further than "Melody Hill," a lovely, 1-bedroom cabin in the Glades Road area of Gatlinburg! From this rental's prime location, this cabin is less than 10 miles from Pigeon Forge, Gatlinburg, and Dolly Parton's Dollywood! 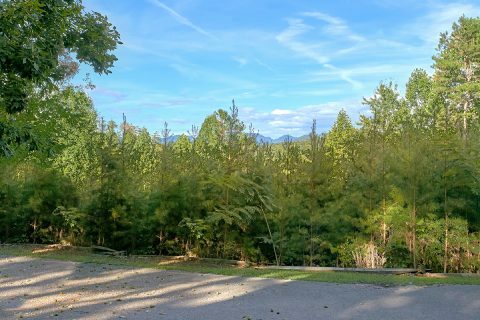 As an added perk, this private cabin is also only a short drive from the Greenbrier entrance to the national park, a particularly peaceful part of the Smokies that's filled with lots of historic sights, waterfalls, and natural beauty. 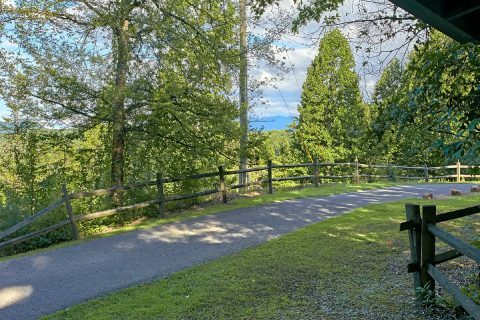 Additionally, this rental is only a short drive away from the historic Glades Arts & Crafts Community, the largest guild of artists and craftspeople in the US. In this community, you'll find lots of crafts stores and workshops that produce beautiful handmade crafts like pottery, weaved goods, wood-carving, and more! 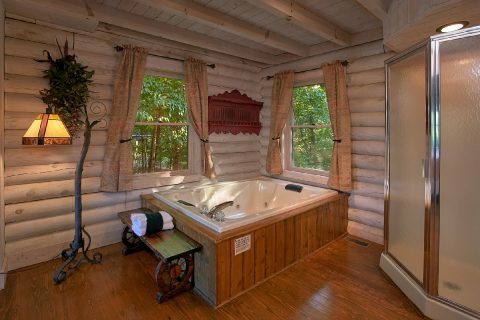 After a great day spent exploring the mountains or riding roller coasters in Dollywood, you'll love returning to this peaceful cabin that has everything you need to relax. 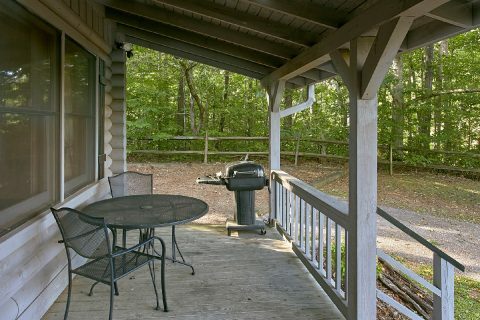 On the covered front porch, you can enjoy sitting back in a rocking chair while the kids play in the yard area. 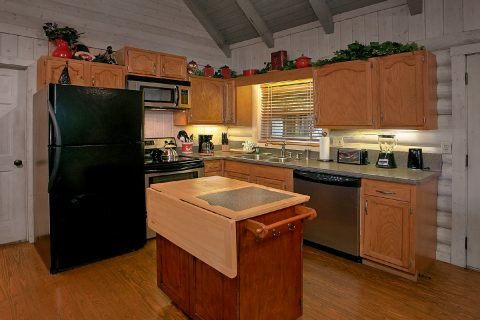 For a delicious dinner, you can fire up the charcoal grill or start cooking in your cabin's fully-equipped kitchen with an island. Once the food is ready, everyone can gather around the table with seating for 4 or dine outside on the picnic table. 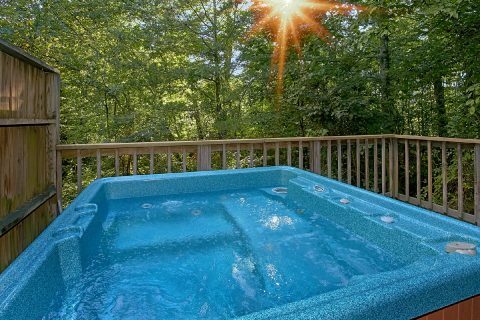 After a delicious dinner, you can sit back in the hot tub on the back deck to immerse yourself in the lovely sights that surround your cabin in the woods. 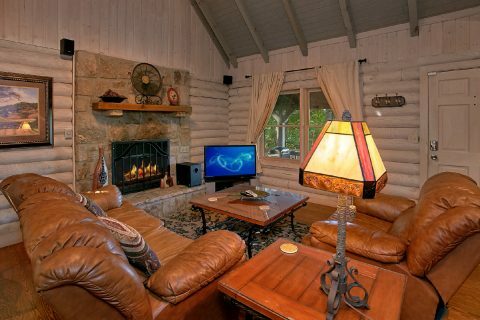 Your cabin's living room also boasts a leather sofa, love seat, gas fireplace, and a flat-screen television for enjoying a fun movie night in your cabin. 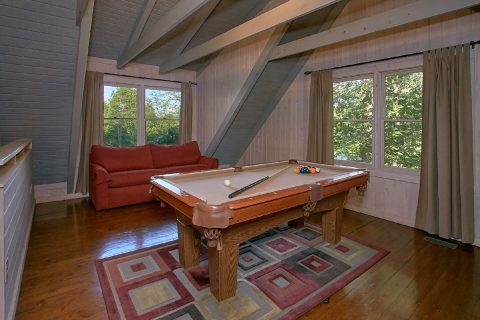 For even more entertainment, you can play pool on the pool table in the upstairs loft. 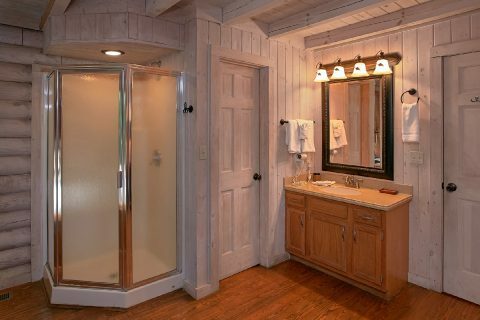 For getting some much-needed rest on your vacation, you can look forward to retiring to the king-size bedroom on the main level that also boasts a private television, jacuzzi tub, and a bathroom with a shower. 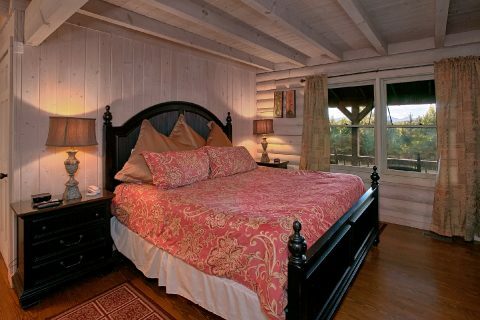 For extra guests, this cabin offers a sofa sleeper in the upstairs loft area. 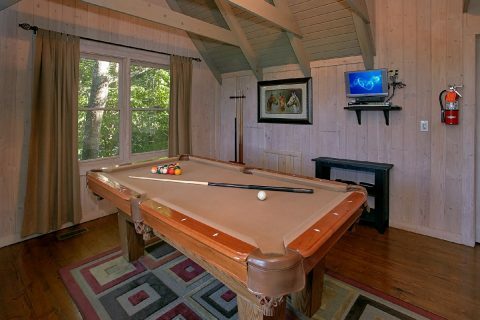 This cabin also boasts practical amenities like WiFi Internet and a gas fireplace for staying extra warm in the winter months. 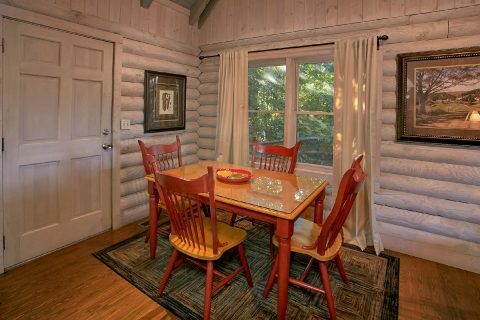 Start planning an affordable getaway to this secluded cabin for a Smoky Mountain vacation you won't soon forget! 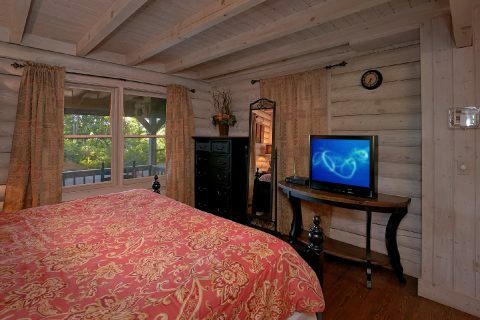 Better yet, you can reserve " Melody Hill" for a special 15% discount when you book it online with Cabins USA Gatlinburg!